Hashtag. Hashtag. Tweet. Hashtag. Meme. Article link. Hashtag. This is how I learn about the recent Lafayette movie theater shooting—through Facebook posts and Google news links and Twitter hashtags. The shooting raises a mess of complex issues such as gun control, mental health debates, the language of racial crimes—issues that are constantly being juggled across these various realms of media. These issues cycle through in a pattern after every breaking story. These issues are always in the air. I got to experience it firsthand when my town became the topic of international attention. I know what it’s like to see a safe place metamorphose into a battleground of news vans—to see a movie theater or classroom change hues and enter into a torrent of violent memories. I was a student at Virginia Tech in 2007 when the April 16th shootings occurred on campus. I watched my school plummet into a Dateline news story and have since seen the aftermath of that story—seen the gun control uprisings and the attack on mental health mandates. I’ve since watched the media ravage other shootings of this nature, picking the bones clean of the shooters’ histories or the victims’ stories. Everyone has an opinion when a shooting like this happens. Everyone has something to post. 3. Wait for next mass shooting. Because violence in these places doesn’t make sense. News sources cover stories about shootings in this world because they are incongruous here—because murders don’t fit. This is a world where two deaths in a movie theater feels like an attack on a country—where death on a university campus in a sleepy Virginia town shifts the lives of a nation. This world is a separate world from the street life in America, where there are different rules on death and violence, where shootings happen every day. If you search “Lafayette shootings” in Google News, over 2 million hits result. If you Google “inner city shootings,” a mere 37,000 results appear. Just this past Tuesday, a 17-year old man was murdered in broad daylight in West Palm, Florida. According to the Sun Sentinel, his death was the 55th shooting in the city since January. His death was part of a series of shootings to occur in less than six hours. Why have larger news sources neglected this coverage? Why is one person’s crime more senseless than another’s? He made this statement in response to a writing prompt I asked my class to complete: write about the soil you come from. I procured this writing prompt from an inner-city literacy program that works with youth in Chicago. is like World War II. is the most violently active 1,000 acres. This 1,000 acres that he refers to is known as the Back of the Yards, a neighborhood in Chicago known for its violence and gang-related activity. In 2013, a mass shooting brought national attention to this area, particularly when a three year-old boy was injured in the crossfire. However, the coverage has since backed off, even though pockets like this exist all across the country, where gang-related, black-on-black crime is a common occurrence. Where are the hashtags for these deaths? Inner city crime rates are vastly more rampant than suburban or rural neighborhoods of the United States, which means that there is a level of desensitization that has inherently occurred. News sources don’t want to waste headline space on these frequent occurrences because they want to garner readership, and an overload of violence will numb an audience. Just as I have been numbed by stories on school shootings. I read statistics in The Atlantic that list the violent crime rate in the predominantly black city of Detroit as 21.23 per 1,000 people in 2012 versus the rate in the mostly-white city of Gross Pointe, MI as 1.12 per 1,000. Of course the 6 violent crimes in this latter location will warrant more attention; they are atypical. They are interesting. They are newsworthy. The 15,011 violent crimes in Detroit are too overwhelming. The statistics are too large to grab a hold of. But in the jail, watching the men in my class who don red uniforms every day and move their pens across the page when I ask them to write, I see the words fill their notebooks that will never have an audience. 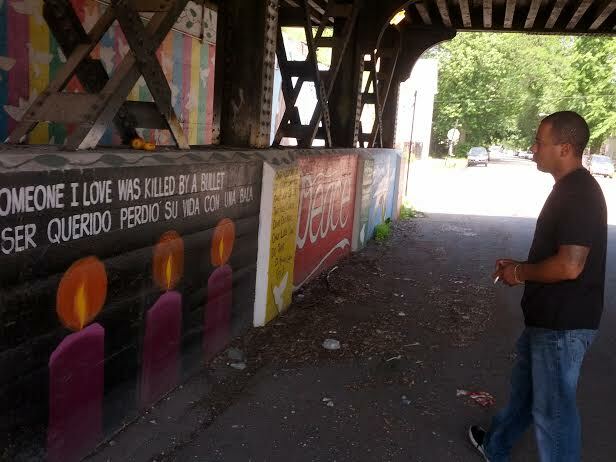 I see the stories of their loved ones’ violent deaths seeping out of them through poetry—through stories that will never get told because these men don’t come from the right neighborhood. The deaths of their cousins or their best friends get lumped into statistics and stacked onto bar graphs that we will skim over noncommittally while reading the attached article. We choose not to connect. I came from the right neighborhood. I went to a school where violence was scarce, so when it happened, it spurned chaos. It created an upheaval in how university systems deal with privacy rights and warning signs — it set into motion some of the larger gun control campaigns we’d seen. When Sandy Hook occurred a few years later, these campaigns grew outraged and gathered steam. They were on a mission. Every subsequent shooting gives them fuel and drive. Every subsequent shooting—in the right neighborhood. In class, I tell my students to write their stories even if no one but me is reading them. I tell them it’s important. I hope that one day it will be. I hope that one day, they’ll be heard. Love what you read? Patronize Whitney Hayes.